Yreka is full of rich and exciting history it is hoped you will be encouraged to visit this great little town and see some of what is offered first hand! In the meantime, please enjoy the snippets of historical information provided here. This blog is copyrighted by Claudia East. The State of Jefferson, The Dream Lives On [2014 edition of the Siskiyou Pioneer]~available from The Siskiyou County Historical Society. The term “greenhorn” when used as a noun is defined by the dictionary as an untrained or inexperienced person, a naïve or gullible person; someone easily tricked or swindled, and also as a newly arrived immigrant or newcomer. So, where does that fall in the category of Yreka History? Locals know of our delightful Greenhorn Park and Greenhorn Creek, situated just south and to the west of the most heavily populated part of town. There is quite a bit of local lore written about “greenhorn”, but most of the stories are similar in nature. One of the early records of Greenhorn is from Well’s History of Siskiyou where he explains that the creek was called Race Creek in the early days because as soon as gold was discovered at Thompson’s Dry Diggings (Yreka) people started looking frantically everywhere along nearby creeks, the one we know today was called Race Creek in the early days because folks “raced” to get there to search for gold. So, how did Greenhorn come to bear its name? As the story goes that little, if anything, was found along Race Creek and was soon abandoned by the miners. One day a new arrival, perhaps an Englishman, came to town and asked where he could find a good place to mine for gold as he was ready to find his fortune. The miners, thought they would put “one over” on this “greenhorn” and sent him up Race Creek to dig fully believing he wouldn't find anything. As he began to work the area along the creek the local miners continued to enjoy their joke on this newcomer. To perpetuate the joke, they began to call it Greenhorn Creek. The joke, however, turned out to be on the miners, as he mined over $7,000 in gold in only a few days! As soon as the word was out, the Greenhorn rush was on; miners quickly wanted to make their own claims along the five mile stretch of the creek. During the years the area was mined, over $11 million in gold was mined from this area. 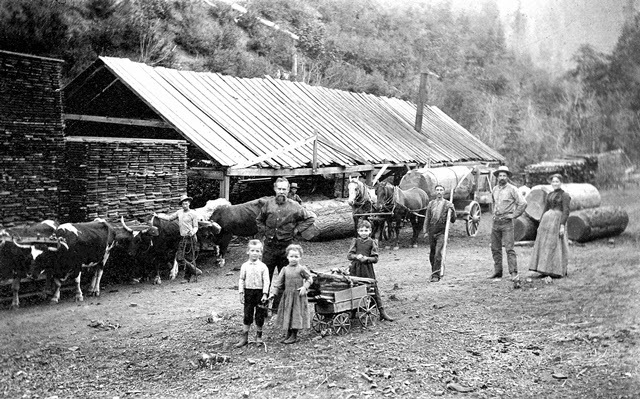 Greenhorn was one of the best producers of gold in the county from 1850 on. The area was even dredged in later years until high bedrock was hit and the dredge could no longer be floated. While the creek was producing gold, however, like many other places throughout the county a small little town came into being and was even given a voting precinct of its own. At one time (circa 1870 – 1881) it had a little general store, a tannery, a glove factory and small furniture factory, and sawmill. There was also a small schoolhouse established in 1859. Today all vestiges of the former town are gone except the Greenhorn Schoolhouse located near the south entrance to Greenhorn Park; the original school building is long gone and the little red schoolhouse we see today was built sometime before 1935 but replaced the original building. The location of the schoolhouse is not in the original position, reported to have been moved between 1947 and 1957; it was originally located near the confluence of Greenhorn and Yreka Creek. This may have been somewhere near where the interstate crosses today. There is a lot of history in this small area near Yreka, there was even an event called the Greenhorn War that initiated over water rights for mining. Today, the Greenhorn Creek as it was seen 150 years ago looks very different today, instead of miners and a sawmill we have a beautiful park, lovely trails, and a lake that is home to many birds and animals. Also, it I seem to remember that some remnants of the dredger were still there. It had burned. This was around 1949-1950.